What is a Chicago Architecture Center docent? 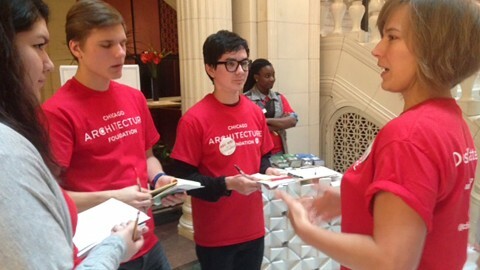 Chicago Architecture Center (CAC) volunteer docents are skilled ambassadors and educators. They develop and conduct public and private tours and serve as interpreters of Chicago’s architecture and its history. Our docents are an elite group of content experts. They are carefully selected and trained to serve as the face of an internationally renowned organization. Although CAC docents come from all walks of life, they share a few common traits. Each of our docent volunteers is a curious and creative lifelong learner. They are passionate about architecture and Chicago. They are flexible and open to feedback, and enjoy interacting with people from all over the world. What does the docent application process entail? First, fill out an application form and pay the $20 application fee. Then, if you're selected to move on to the next round, you will be interviewed by CAC staff and current docents. Attend a docent information meeting to receive the most current information about our next docent class. Commit to attending all training class sessions. Commit to completing all class requirements. Be available to give weekend tours. Due to the challenging requirements of our training program, we do not accept full-time undergraduate students to our docent training program. Once I’m accepted into the program, how do I train to become a docent? Our docent training is a rigorous experience. The program aims to give new docents a broad understanding of architecture and architectural language, as well as the confidence and skills necessary to lead a specific tour. Introduction to the Chicago Architecture Center – A two-hour orientation to answer all your questions about our organization. Fundamentals of Chicago Architecture – This class meets once a week for a full day to discuss Chicago architecture and history. It includes a broad look at architecture and techniques for developing and conducting tours. Tour training for a walking tour – After completing Fundamentals, trainees meet once a week for four weeks to focus on developing and mastering at least one CAC tour. These classes include tour demonstrations, tour practice and assistance in creating a tour that meets CAC standards. Training for one additional tour – Trainees meet once a week for two or three weeks to learn one additional walking tour. What is expected of a CAC docent? Once your docent training is complete, we hope you’ll be excited to put everything you’ve learned to use. You’ll join the ranks of CAC docents who happily share their knowledge and passion for Chicago, its world-class architecture and the urban environment. Our docents commit to giving a minimum of 13 tours during their first year of service. After that, each docent is expected to give a minimum of 10 tours every year. Docents also commit to continuing their education by attending docent-planned enrichment activities and/or conducting their own research. 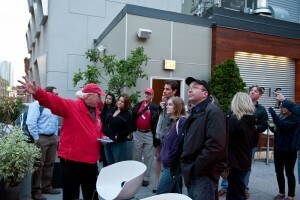 But most importantly, our docents are expected to enthusiastically represent the CAC and the city of Chicago. Applications for the docent class of 2019 are now closed.